> It is not everyday that a Scripture lesson from the lectionary gets exegeted in a national magazine right around the time many Christians in the pew will be hearing it from the pulpit, but last Sunday’s Gospel lesson from Mark 8 was an exception. 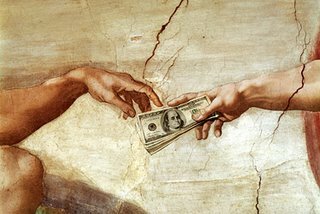 For those who may have missed it, the article was in Time and was titled: Does God want you to be rich? by David Van Biema, and Jeff Chu. The article addressed the new (or actually the old) prosperity gospel, what some now call “prosperity lite,” a new generation of prosperity preachers and evangelists that seem firmly planted in the tradition of Jim Bakker and the PTL club, but with a softer, subtler tone so that some of the more glaring biblical dissonance is less apparent. Among others, Biema and Chu mention a lot of the mega-church televangelists /preachers like Joel Osteen, T.D. Jakes, Creflo Dollars, and Joyce Myers. I was a little surprised that Kirby John Caldwell of Windsor Village UMC also made the short list, but in Jakes’ and Caldwell’s case, the authors are quick to point out that there are significant differences, especially regarding justice and economic empowerment for the poor. The message of “prosperity lite” is not new, but it goes something like this: God wants you to prosper, to bless you, not just in heaven after you die, but right here and right now. Give your money to God and God will bless you two, three – or if you are truly “grace-full,” maybe seven-fold. In short, God wants you to be rich, not just in love, peace, and joy, but rich in greenbacks, good fortune, and material goods. Those who aren’t familiar with the televised versions of this stuff are no doubt familiar with its popularity in the bookstores, most memorably with Bruce Wilikinson’s The Prayer of Jabez: Breaking Through to the Blessed Life. The larger pericope for the Fifteenth Sunday after Pentecost was actually Mark 8:27-39, which begins with Jesus asking the question: “Who do people say that I am?” This first question is general. It is a kind of cultural test balloon sent up to check in with the latest town gossip. Who do people say that I am? In other words, what’s up? Hear anything about me lately? Any wild rumors? Any crazy speculations? Any good press? Any bad press? What are people saying these days? Good, bad, or indifferent? Do they even notice something is up or are they too busy to see beyond their daily schedules? The disciples didn’t need to have their ears to the ground to know the answer. They had been hearing things. They knew there were rumors around town. They knew that people were talking about Jesus and drawing their own conclusions. They knew that people were debating who Jesus really was. Some were saying he was John the Baptist. Not a bad guess, when you think about it. The people saying he was John at least believed in the resurrection, because John the Baptist was already dead. In Mark’s gospel at least, he was beheaded by King Herod back in chapter six. No doubt Herod was among those who thought Jesus could be John, come back to torment him; perhaps the paranoid king was guilt ridden about his life and the presence of the only one who had held him accountable for his behavior. There was a third answer floating around. Some thought Jesus was one of the prophets. Not as good an answer as the other two, but at least this crowd also thought that someone extraordinary was in their midst; someone who stood in the prophetic tradition of Israel; someone who had come to stir things up, shift things around, and call God’s people to righteousness, faith, and justice. If only they knew. But the seminary class is not over. It may have looked like a multiple choice quiz, and so far all the answers are not so bad, but Jesus then looks directly at his disciples and gets to the heart of the matter: But who do you say that I am? Ahhh. There it is. The real question. Not the academic, arm chair question that can be tossed around abstractly and debated for hours on end. Not the speculation of crowds, students, and Bible scholars who love debate and the sounds of their own voices. No, the real question. The question of allegiance. The question of trust. The question that demands that we get off the fence, make a decision; put up or shut up. But who do you say that I am? Who do people say that I am? Well, Lord, some say you are the best chance we have to get rich quick. Some say you are the most cost effective way to avoid paying for a therapist. Some say you a big, divine ATM in the sky, dispensing money to anyone who has the right code to punch into the prayer line. Some say you are the opiate for the masses; the religious crutch that weak people need to get by every day. Some say you a figment of people’s imagination. Some say you were a first century teacher and rabbi that was a good man but nothing more. Some say you were crazy. Some say you were wise. Some want to do anything they can to avoid you. Some what to spend their whole lives disproving your wild claims to be the Son of God. Some want to run away. Some want to sit at your feet. Some want to follow. It has been said that the most subversive, the most radical, the most challenging, and the most difficult thing to say is “Jesus Christ is Lord.” Scripture tells us that no one can say “Jesus is Lord” without the Holy Spirit. To say Jesus is Lord is to submit to Jesus’ reign, to relinquish our will, to die to sin and self-interest, to turn from our own way, to fall down at the Master’s feet, to ask forgiveness for our sins, to place God above all other things and all other persons. It is to walk in love, to make peace in the midst of conflict, to seek justice in the midst of oppression, and grow daily in holiness of heart and life. It is to walk the way of the cross, to seek to love God with all of your heart, soul, mind and strength, and your neighbor as yourself. If any want to become my followers, let them deny themselves and take up their cross and follow me. Discipleship, at least Jesus’ version, is more than a path to get rich quick. It is to take Jesus at his word, and not change the question that Jesus is still asking. The question is not: “Can I have my eternal cake and eat it here also?” The question is not: “Why not gain the whole world plus my soul?” The real question that gets at the heart of the matter is: Who do YOU say that I am? My guess is that our answer will have to go beyond the superficial aspirations to “live large” and “get mine” while we are living on this side of the grave.